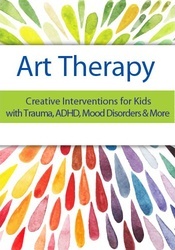 Laura Dessauer, Ed.D, ATR-BC is a board certified art therapist with a doctoral degree in counseling psychology working with families for 25+ years in over 21 school districts. Dr. Dessauer’s work has been included in Parent’s Magazine, eHow Parenting, YourTango, FoxNews, PBS “This Emotional Life”, Lifetime Network, Working Mother, and Psychology Today. Dr. Dessauer is contributing author of “Healing with Art and Soul: Engaging One’s Self Through Art Modalities” (Cambridge Scholars, 2009). She has presented at the Eighteenth Annual National Expressive Therapy Conference, National American Art Therapy Association 40th Anniversary Conference, and American Art Therapy Association Institute for Creative Education in Art Therapy (ICE/AT), and has created international online training courses for therapists. Dr. Dessauer is passionate about helping families develop creative ways to confidently communicate and creatively connect. In her private practice she specializes in working with children who shutdown, meltdown and act out. She playfully blends cognitive behavioral skills, art-making, and creative problem solving to help clients create individualized social, emotional, and behaviors interventions that “stick to their brain”. She has created a relaxation CD, “The Creativity Queen’s Superfabulicious Self-Soothing CD”, and therapeutic coloring book, “The Creativity Queen’s Superfabulicious Colorific Adventure Book” for her clients. Her business, the Creativity Queen, LLC, was the winner of the 2007 Small Business of the Year Award (SCORE). Non-Financial: Laura Dessauer is a member of the American Art Therapy Association and the Florida Art Therapy Association.